I can assure you that floating in a kayak down the Snowy River through the rugged Byadbo wildernessregion of southern Kosciuszko National Park, idly watching platypuses drift by, is an idyllic way to spend one's time. No phones, internet or 24/7 news cycle here. 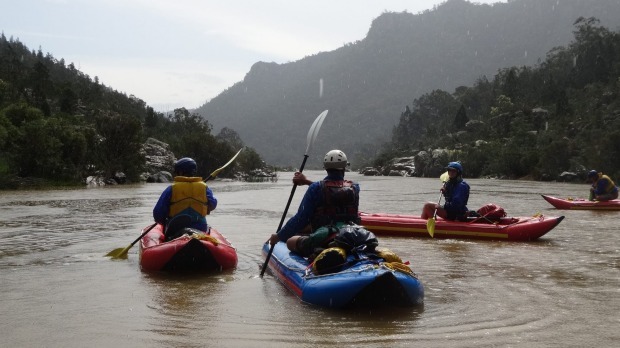 I had signed up, together with Bob, an old army friend, to take part in a five-day white-water kayaking trip, 70 kilometres down the Snowy River, offered by Alpine River Adventures based in Cooma. The trip is formally titled the Five-day Byadbo Wilderness Expedition. Alpine River Adventures is a small family business based in Cooma run by Richard Swain and his partner Alison Ruell. Richard runs the operational side of the business while Alison manages administration and logistics, and acts as ground control when Richard is in the field. It is a friendly personal business. A friend, James, drives their Toyota Land Cruiser, and Richard pulls in other local friends with river experience and the necessary certifications to help out as required. Under the terms of his agreement with National Parks, Richard is only allowed to take up to six customers at a time on the eco-sensitive Byadbo Wilderness Expedition. One of the designated activities is doing a platypus count on sections of the river near the camp sites. On this trip, the customers were Bob and I and two doctors from Canberra, Tony and Katey. In addition to the four of us, "Toolz", an old school friend of Richard's, joined the group. He was a valuable addition because of his campfire lighting skills. Richard also had two very capable assistants – Chris and Laura – recent university graduates who were experienced kayakers. We all met up at a Cooma car park at 7.45am on day one before driving in convoy to Richard's house on the outskirts of town. There we left our cars in a secure area and were kitted out for the river. We soon piled into a Toyota Land Cruiser with trailer for the drive to Bombala (where early risers can see platypuses in the river from the main road bridge), then on to Delegate (where there is an interesting art gallery), and finally down a long dirt road descending steeply to the Snowy River. The whole trip took about three hours. It was raining on and off so driving conditions along the last section were challenging, even for a four-wheel-drive. The Snowy River now runs at about 10 per cent of its natural flow. For many years the Snowy Mountains Scheme starved the river of water, killing off a lot of the river life, including the eels that migrated annually upstream from the coast. The 10 per cent flow it now has is just enough to give the river a chance of supporting fish and platypuses. It can also be kayaked again. On arrival at a narrow stretch of the river – about 50 metres wide at that point – the kayaks were inflated, we packed our dry-bags on board, and had some basic practice paddling on a slow-moving section of the river. We then paddled downstream to set up camp where the river widened to about 100 metres. It continued to rain heavily and although the rain stopped after the first day, we had to wait another day for the heightened river level to subside. We passed the time talking, eating, reading, and hiking. It was the most down time I have had for many years. Alpine River Adventures cannot of course guarantee the weather. Customer safety is the main consideration on the river. Because of the Byadbo region's remoteness it would take some time to get help if needed. Richard kindly offered us an extra day free-of-charge to make up for the delayed start, which Bob and I were happy to accept. Unfortunately for the two doctors, they had commitments back in Canberra and would have to leave after the scheduled five days. On the first day of river travel, we soon reached the Snowy River Falls. Richard, Chris and Toolz portaged the kayaks, while we, the pampered customers, went with Laura to look at the falls we had to bypass. They were spectacular and certainly not kayakable. We saw a couple of red-bellied black snakes while walking through the rocky area to the falls, but they are slow-moving and timid and don't pose a threat unless you step close to them. After retrieving our portaged kayaks downstream from the waterfall, we ran our first rapids, including Wild Woman, a grade-three rapid. It was exciting but safe because if you come out of the kayak you just float downstream in your buoyancy vest lying on your back with your legs up until you can be recovered. None of us overturned or fell out – although to my embarrassment, after getting to calm water I managed to overbalance backwards and was the first to fall in. The water temperature was about 15 degrees. Over the next three days, our campsites provided spectacular views of the river. Richard, who has Aboriginal heritage linking him to the area, took us to look at old Aboriginal campsites with their plentiful artefacts, and showed us trees where Aboriginal people had cut canoes from the bark. The beauty of travelling downstream is that if you stop paddling you still end up at your daily destination. There is also more chance of seeing wildlife from the river when you are floating serenely along. Platypuses were the most commonly seen fauna, though we saw many wild horses, often with foals, and wallabies. There were also deer and goats. The birdlife included eagles and lots of water birds. The area was badly burned out by the 2003 bushfires but has regenerated well over the past 13 years. For most of the way the river ran through spectacular rugged mountain scenery which relatively few people have seen. Hordes of flies were the one negative aspect. They besieged us from dawn to dusk except when we were on the river. Apparently they hatched earlier this summer because of the unusually warm weather. Dung beetles were expected to make an impact on fly numbers as the summer progressed. Alpine River Adventures provided most of the camping equipment needed – tents, groundsheets, mattresses etc., with the exception of sleeping bags. The camping was enjoyable and relaxed, with no great urgency to get moving in the mornings. We were rarely on the river before 10am. The cooking was fairly basic but it would be difficult for it to be otherwise on a trip like this. Richard provided good wholesome organic food and no one went hungry. At the end of day five, we met up again with James and Alison and the Land Cruiser at one of the few road access points to the river. They provided a hot chicken lunch and birthday cake for Bob who turned 71 that day. They then drove the two doctors back to Cooma while we paddled on to the next campsite, which was rich in Aboriginal artefacts and an old boundary tree marked "OW 1942". Our last day on the river was spent paddling through small lakes and rapids until we reached the mighty Wet Cheeks rapid, which is another grade three. By this stage we were old hands and had no problem following the approved line through the rapids, even managing to keep our kayaks pointing in the right direction. We ended our marathon paddle at about 5pm at a campsite imaginatively named No Name where the ever-reliable James was waiting with the Land Cruiser and a meal of mixed sausages, wholemeal buns and coffee. The trip from No Name to Cooma took about two hours and on from Cooma to Canberra was a bit more than an hour. It was a great way to spend six days with delightful and capable people who care deeply about the Byadbo wilderness region. It was certainly one of those trips that will be retained in my aging memory bank as one of the most memorable I have done. The whole trip costs $1250 and you need to be reasonably fit – but the Byadbo wilderness is a spectacular part of Australia that is well worth the effort of moving outside one's comfort zone to experience. Alpine River Adventures is at RiverGuide.com.au, (02) 6453 3016. They also offer one-to-two day Snowy River white-water kayaking options and, nearer to Canberra, one-day white-water rafting through the Murrumbidgee River's Red Rock Gorge. Clive Williams travelled at his own expense.